After the declaration of the Italian war against the Austrian-Hungarians on May 24th 1915 and the Italian decision to send some troops to the Macedonian Front-line, the 35th Italian Division was given the order to move to Macedonia. This Division belonged till then to the 1st Italian Army. Its transport to Macedonia begun on July 31st 1916, and its first troops arrived in Thessaloniki on August 8th so as to be forwarded to the Macedonian Front-line. 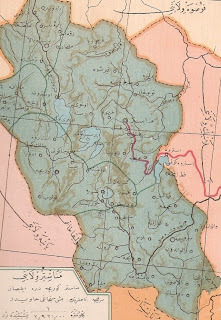 We must note here that in order to transfer its supplies, it used mainly the railway line Salonique-Monastir, which went up as far as Armenohori in Florina. 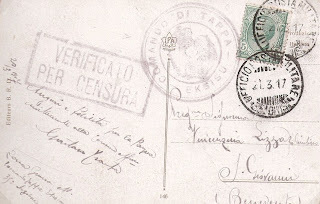 Picture postcard free-posted from COMMANDO DI TAPPA EKSISU (Supplying Station of Xino Nero-Florina) with censor checking in the unit (VERIFICATO PER CENSURA) via Salonique, where it was franked with 5 CENTESIMI version 1906 and stamped UFFICIO POSTALE MILITARE – 35 DIVISIONE on 21.3.17, with final destination BENEVENTO ITALIA. Postal rate: 5 CENTESIMI for postcard destined to Italy. 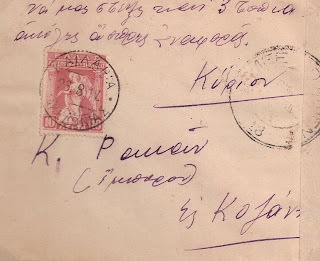 Registered letter posted from ΑΥΓΕΡΙΝΟΣ-(AVGERINOS-KOZANI) on 15 MAI 1935 stamped with the two-circled stamp ΤΑΧ.ΤΗΛ.ΑΥΓΕΡΙΝΟΥ–ΕΛΛΗΝΙΚΗ ΔΗΜΟΚΡΑΤΙΑ/(HELLENIC REPUBLIC/AVGERINOS POST TELEGRAPH OFFICE) it arrives at ΘΕΣΣΑΛΟΝΙΚΗ-ΣΥΣΤΗΜΕΝΑ -(THESSALONIKI-REGISTERED) on 17.V.1935. Then it arrives at NEW YORK REG’Y. DIV. 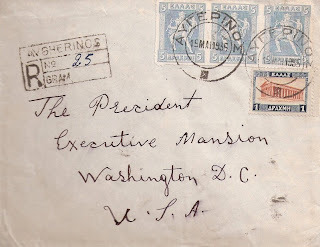 on 28.5.1935 and finally to the destination of WASHINGTON D.C REG.SEC on 28 MAY 1935. Postal rate: 16 drs for registered letter destined to the U.S.A. [8 drs for letter ''a'' scale’s weight plus 8 drs for registered letter rate from abroad (Dec.1933-FEK. 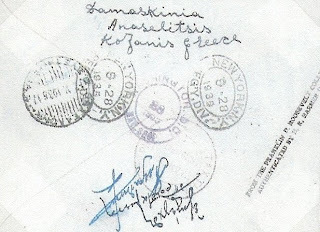 85)].The cover was brought by the sender open to be examined if values are contained without authorization of the Bank of Greece, according to regulations occasionally issued since1931.After the sender sealed the cover in presence of the post office's head, the letter wrote''εξηλέγθη''(examined) on the reverse side and signed his endorsement. The certification was stamped with the official cachet ΕΛΛΗΝΙΚΗ ΔΗΜΟΚΡΑΤΙΑ / ΤΑΧ.ΤΗΛ. ΤΗΛ. ΑΥΓΕΡΙΝΟΥ. (HELLENIC REPUBLIC/POST-TELEGRAPH-TELEPHONE OFFICE of AVGERINOS) . After the burst of the National Defense Coup on August 17th 1916, West and Central Macedonia was under the control of these coups. On September 26th, when Eleftherios Venizelos set up in Thessaloniki his provisional government, Crete and the islands of Eastern Aegean had already acceded to the coup. In the meantime, at the end of August in 1916, the Germans and the Bulgarians had already conquered the whole eastern Macedonia as far as the Strimonas river. From West Macedonia and Northern Heperos they had conquered the lands of Florina and Kastoria. During the winter of 1916-1917 the power of the “Provisional Government” of Thessaloniki was extended to the areas of the “State of Athens”, such as Eptanisa, Cyclades North Sporades and Pieria. At the same time the Allies, conquered again Florina and Koritsa and the Italians the land of Argirokastro, which up until then was controlled by the “State of Athens”. In November 1916 in order to avoid the conflicts - between the powers of the National Defense and some units loyal to the government - the Alies traced a neutral 5-10 km zone between the areas that were controlled by the two Greek Governments. Finally, in May 1917, with the probability of Konstantinos enthronement, the French conquered the neutral zone together with the biggest part of Thessaly whereas the Italians conquered South Heperos as far as Ioannina and Parga.The French, supporting in the meantime Eleftherios Venizelos “Provisional Government”, had a strong presence on the areas that were under their control, and among others, they censored the mail distributed in the area. Envelope posted from ΚΑΙΛΑΡΙΑ–ΜΑΚΕΔΟΝΙΑΣ/(KAILARIA MACEDONIAS,now PTOLEMAIS) dated 26.8.17, which was opened, censored by the French Army and stamped CONTROLE POSTAL MILITAIRE, together with the two-circled stamp ARMEE D’ORIENT 13 (CENSURE MILITAIRE), destined to Kozani. 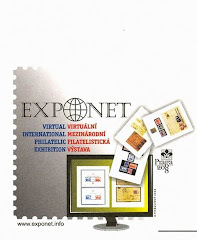 Postal rate:10 lepta for simple letter which arrives to the interior of the country. West Macedonia’s Ottoman Post Offices of today, offices that then belonged to the Vilayet of Monastir, started working after the second half of the 19th century and up until the days of the Macedonian liberation by the Greek army during the wars of 1912-13.In the area of West Macedonia thirty-two post offices have worked,as we know till now, five of which without known stamps. 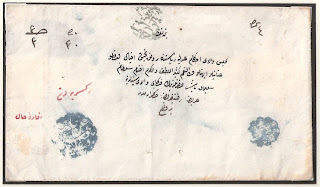 From these towns , market towns , villages where Post Offices existed during the Ottoman period, eight belonged to the sanjak of Koritsa, five to the one of Monastir and the rest nineteen to the sanjak of Servia.These Ottoman Offices provided various services to the public, such as the administration of registered or simple letters from overseas or mainland Greece, as well as parcel services and of registered value (not all of them). Furthermore, the Post Offices that owned a telegraph office provided 24-hour telegraph services mainly in “Eastern” languages. 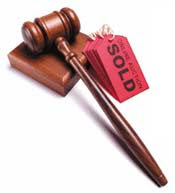 Generally, their services can be characterized as very good. In the project, the abbreviation (N.G.) is used, which means the study and classification numbering of Α.NICOLAS-A.GALINOS. 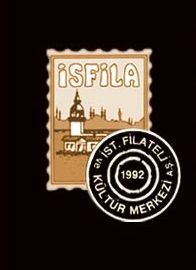 Also, the abbreviation (P) which stands for PULKO, is the list-catalog of the Turkish stamps. Envelope posted from NASLIC-(now ΝEAPOLI-KOZANI) in 1876, franked with 2 pi of 1869 (P.47a) and 20 para of 1875 (P.63) and stamped with NASLIC. It arrives via Salonique to Constantinople. Type of stamp 1(N.G.). Postal rate: 2 pi and 20 para for simple letter with prepaid double tax according to the U.P.U. (18.6/ 1.7-1875) of ''a'' scale’s weight, destined to the interior of the Ottoman Empire. 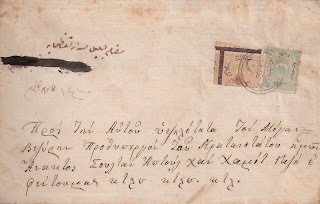 Prefranked envelope posted from KESRIE-(ΚΑSTORΙΑ) and destined to ISTANBUL-(CONSTANTINOPLE) 1841. Postal rate: 3 kurus and 30 para [left: (3x40pa)+30pa=150pa=3 kurus and 30 para, because 1 kurus=40 para]. The weight of the envelope was 3 dram. Kastoria was on the way number 2 to Constantinople,155 hours away. The postal rates during the prefranked period were estimated according to a system, which was based on the distance (from already given lists). In this way, we had for every one hour distance and for envelope weight 3 dram postal rate 1pa. Every extra dram was charged with 0.5pa for every one-hour distance. So, at this point, the postal rate is correct ( 1x150 hours=150para).